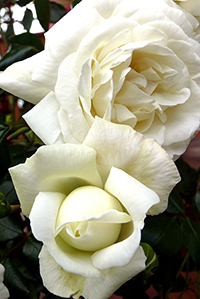 Often referred to in rose groups as the White New Dawn rose, the rose White Dawn was first bred in 1949 in the United States by rose breeder LE Longley. This large climber was created by crossing the New Dawn climbing rose with the Lily Pons rose. The result is a magnificent climber that can grow as tall as 14 feet and produce beautiful white blooms that are sure to catch any rose lover’s eye. White Dawn roses thrive best in zones 5 through 9 and have a strong resistance to blackspot, which is a true bonus to many newer growers who find themselves plagued by the disease. The rose White Dawn does not have a terribly strong fragrance but it does have a simple, but subtle rose scent to it. This is the type of rose you plant on a patio or near a window you frequently keep open, when you want the smell of roses but don’t want it to be overpowering. The White Dawn will sometimes bloom again in the late season, but most often it will give you a single Spring bloom. Growing the rose White Dawn is pretty standard and there are no specifics to this variety that you need concern yourself with. Stick to the basics and you should have no trouble growing this rose to peak performance. You should plant this variety in a location where it gets ample sun light. Partial shade will just not do. A good rule of thumb is to give your roses a location that gets at least 6 to 8 hours each day of direct sun light. 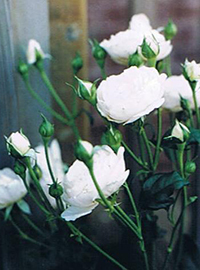 Your White Dawn roses will also do well if you plant them in soil that is well drained. If you are unsure about the quality of your soil, read on to the next section where we give you an easy method of turning any garden soil into rose heaven! It is also good to try and keep your rose White Dawn in a spot where it is subjected to the natural air currents throughout your garden. Air moving across the leaves will help keep them dry and that in turn will help keep the overall plant healthy and performing the way you want it to. Before you begin planting your rose White Dawn, I highly suggest you take a trip to your local garden center and pick up a bag of organic compost. When you dig the hole for your roses, mix the compost in with the soil at a ratio of 1 part compost for every 2 parts soil. No matter how good your garden soil is, this is a great mix that your roses will love! Now if you bought your White Dawn roses locally, they were more than likely already started in containers. These are real easy to plant. Dig yourself a hole that is at least twice the diameter of the container and equally as deep. This will give you ample room for your soil mix while still keeping the bud union at the same depth it was originally planted. If you bought your rose White Dawn from an online retailer, then it was probably shipped to you as a bareroot plant. These can look a little scary if you’ve never planted one before, but I promise you they are not hard. You should soak the plant overnight in a bucket of lukewarm water to help rehydrate the roots before planting. Then dig the hole as wide as the longest roots and deep enough so you can set the plant atop a mound of soil and still keep the bud union about an inch or two below the surface of the soil. Once your rose is set in place, spread the roots out in all directions and then back fill the hole halfway to start. Using the garden hose, water the loose soil heavily until it flows around the roots like mud, then go ahead and back fill the rest of the way. Give the loose soil one last watering and be sure to top off any final settling that may have occurred. Taking care of the rose White Dawn is not at all difficult and like I said earlier, basic rose care guidelines will give you great results here as well. You need to make sure that you are giving your roses plenty of water, but still allowing them to dry out in between each watering. A good rule of thumb is one deep watering each week, and try to avoid watering the leaves needlessly. You should also give your White Dawn roses a dose of a good all purpose fertilizer in the early spring when the leaves begin to form. Typically for repeat bloomers you would want to give them additional feedings throughout the growing season, but that isn’t likely to benefit you much on this variety. I would give one more feeding around midsummer to try and encourage some later blooms. 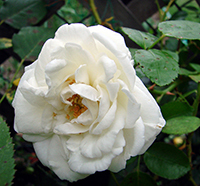 You should always prune the rose White Dawn in early spring before the leaves open up. This allows you the ability to see all the canes clearly. Start by cutting out all the dead canes, as well as any that look discolored. Next, start cutting back some of the smaller lateral canes that overlap one another so that these do not compete with one another later for sun light. 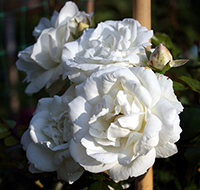 Lastly give your rose White Dawn a light pruning for shape and to encourage new growth. This is also the time you should rake up all the dead leaves and debris that have collected around the base of your rose from the previous growing season. Throw away this material in the trash along with your cuttings. Never let decay matter lay around your roses and never throw the cuttings into the compost bin because some spores can lay dormant all winter only to reinfect your plants the following spring. Finish up your pruning by giving your rose White Dawn a fresh layer of mulch to start off the new season.